I love to read books and I'm grateful to all the readers who have read mine. Books are important to me, both writing them and reading them. They provide an escape, allow me to dream of possiblities and expand my horizons. So as a special thank you to readers, I'm giving a gift for the month of Valentine's Day. Nightly Special is my short story from the anthology, Vampires, Werewolves and Zombies, Oh MY! The anthology was penned by a few authors from Florida Romance Writers to raise money from our chapter. Nightly Special is now available as a stand alone story and absolutely FREE on Smashwords. I had a new cover designed and had the story formatted. I hope you enjoy! And thank you for all your support and your love of romance novels. Seduced by the Wolf available for pre-order! SEDUCED BY THE WOLF, my March Nocturne Craving, is now available for pre-order on Amazon! Jarrett Lawson can't fall in love—but he needs a woman. 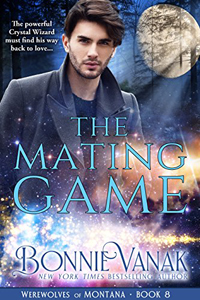 Pack rules dictate that as the alpha male, he must mate before the rest of his shifter community can. But after losing his cherished wife, Jarrett has vowed never to risk his heart again. A vow that is tested when Ariel Abidos reenters his life. The Cobra and the Concubine, from my Khamsin Egyptian series! I had it reformatted. Next up will be The Scorpion and the Seducer, and then all seven of my Khamsin Egyptian historicals will be available. The Covert Wolf, my August book, is finished and turned into my editor. Right now I'm working on the next Nocturne Craving, as well as a proposal for the next Nocturne. To read a preview and order Cobra on Smashwords, click here. To order Cobra on Amazon, click here. New cover, New Year and contest winner! 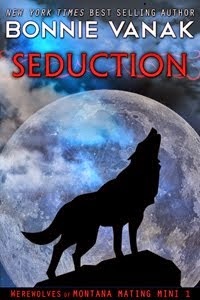 Here's the cover for SEDUCED BY THE WOLF, my Nocturne Craving for March. It's another short story in The Ancients line. The reason why she's lit from within? When she gets sexually excited, she glows. I mean, REALLY, glows. SEDUCED BY THE WOLF is the sequel to HUNTED BY THE JAGUAR. Wolf features Jarrett, the werewolf. I liked his character so much I decided he needed his own story, especially since he had lost his mate and child. It's a new year and I'm pleased to announce the winner of my contest from last month is Cathy (Caffie!) Cathy please email me for your prize. In other news, I finished the book! Yay!!! The Covert Wolf is scheduled for release this August. I wrote the book in three months. It was very, very tough, with working full-time and traveling for the day job, plus the holidays, but I did it. It's not easy being an author, whether you work a day job or your FT profession is writing. Deadlines must be met, and then life happens. 2011 was a tough year. We lost my beloved father-in-law, and had lots to deal with in a haze of legal paperwork. It's not over. But we are blessed with good family and friends to help us through. For Christmas, we went to Tennessee, and had a lovely time with my great brother and his very sweet, very fun wife. It was good to get together with family. And it was cold! Just as cold as South Florida promises to be tonight. In celebration of finishing the book, we'll probably have a fire in the fire pit, and toast the New Year with a bottle of red wine. Here's hoping 2012 is good to you, and brings you and yours plenty of blessings, and everything your heart desires.